Ivory Coast coach Herve Renard says his team cannot rely only on Wilfried Bony and Yaya Toure at the Nations Cup. "Wilfried is a goalscorer but needs to be in good shape," said Renard. "Yaya has not been the best player in Africa for the last four years for nothing. "But we need to build a team capable of working well together. That is the most important thing in football, not names. "If you came here with Cristiano Ronaldo and Zlatan Ibrahimovic I don't know if it would work." Renard's side kick off their campaign against Guinea on Tuesday and will also face Mali and Cameroon in Group D.
A winner of the Africa Cup of Nations with Zambia in 2012, the Frenchman took charge of the Elephants after last year's World Cup, but his side did not always convince in qualifying after striker Didier Drogba retired from the international stage in August. "We are always one of the most fancied teams but a lot of things have changed from previous years," added Renard. "The squad is a lot younger now and if you base it on our qualifying campaign I don't think we can be labelled one of the favourites. "When a team comes up against the Ivory Coast they know what that means - three consecutive World Cups, players who play for the very biggest clubs. "But we need to find greater collective cohesion if we want to achieve anything." Of Chelsea veteran Drogba, the symbol of the country's 'golden generation' which agonisingly lost the 2006 and 2012 Nations Cup finals on penalties, Renard said: "If he is not there it's because he didn't want to come - otherwise he would certainly have been here. "We can't ignore our best players when we go to a major competition, but he didn't announce his retirement in December. It was in August." 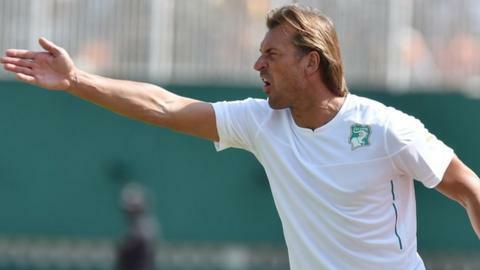 Meanwhile, Renard said that his side had not experienced any of the logistical problems faced by several of the other competing nations, with the likes of Congo Brazzaville and Tunisia complaining of a shortage of rooms and power cuts in their hotels on the mainland. "For us everything is going well. We arrived last night (Friday), I think the technical staff and players all know this place, because the Ivory Coast have been here before. We have already trained on this pitch. "Now we just need to adapt to the conditions of an Africa Cup of Nations, that's all. For the moment there's no problem."